Tibet is on our list of Five Recommended China Tourist Destinations for 2019. Our advice is still to apply early and have alternative plans. A Tibet Entry Permit is required and you&apos;d better apply for it at least 20 days before your trip. 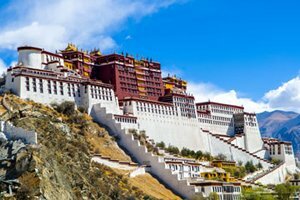 If you travel with China Highlights we will make all necessary arrangements for the Entry Permit, we can help you to get a Tibet Permit when Tibet is open to foreigners (during stable political conditions). Send your passport and China visa copies at least 7 working days before departure to Tibet if you enter Tibet by train. The earlier the better. 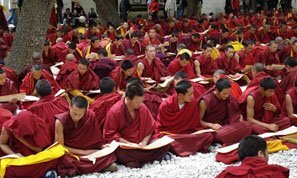 If you are taking flights to Tibet, you are suggested to send passport and China visa copies at least 15 days before departure. Because original permits must be check when boarding, so extra time is needed for mail delivery. Mid spring to late autumn is the ideal time to travel Tibet. Tibet was closed for most of February and March in 2017 for the politically sensitive time of Tibetan New Year. And it will be closed from Feb.21 to Mar. 31 in 2019. It will be reopen from April 1st. 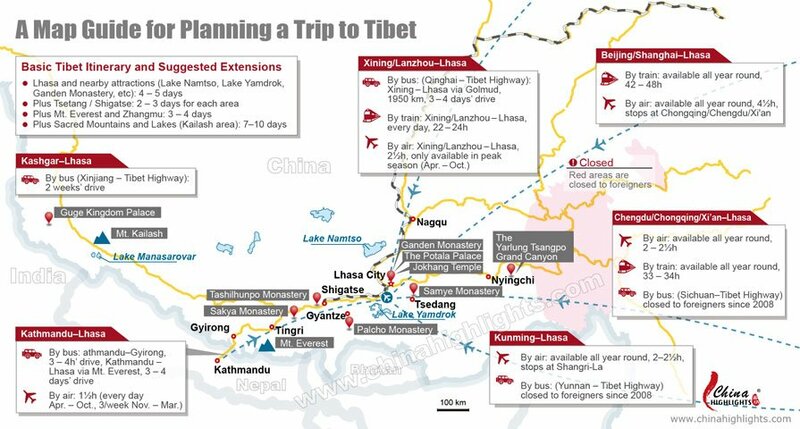 So we suggest you to plan a Tibet tour from April 15th considering the time of applying for the permits. Spring in Tibet is April and May. 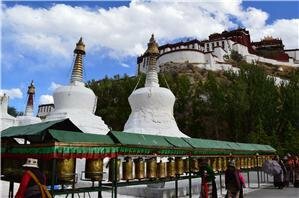 Tibet will normally be reopened from early April. It’s a good time to travel, before the summer tourist crowds arrive. 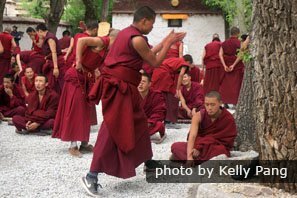 Tibet&apos;s summer time is a "sea of festivals", with thangka unrollings, horse races on the grasslands, and other significant Tibetan Buddhist events. The weather is warmer and the oxygen content is higher. Thus summer is the peak travel season for Tibet. Autumn in Tibet is September and October. It’s also a busy travel time in Tibet as it has good weather for hiking and camping. If you travel Tibet in winter, you may meet harsh weather conditions. And tent hostels in Everest Base Camp will be closed. However, the hotel price, flight/train ticket price will be more reasonable. And you can avoid crowds in winter. 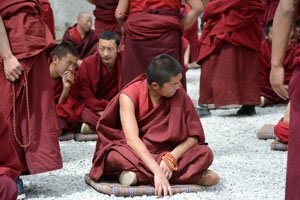 Note that Tibet will be closed during Tibetan New Year period, usually falls in February and March. Should I Take a Train or Flight to Tibet? No matter whether you take a plane or train to Tibet, it&apos;s hard to avoid high altitude sickness. We suggest you to fly in, because, though the Qinghai-Tibet Railway gives you more time to acclimate, it actually goes much higher than Lhasa (5,072 m compared to 3,700 m), increasing the risk of symptoms. Therefore you may not have a good rest on the train, which can make your body tired and easily get sick when you get off. 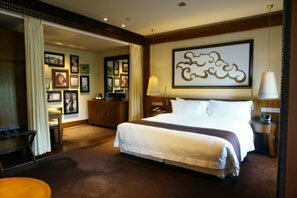 It would be better to acclimate in your hotel room and Lhasa than on a train. What&apos;s more, it&apos;s much easier to book a Tibet flight than a train, due to the high-demand for a limited number of train tickets. 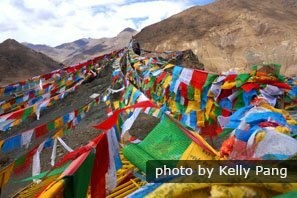 As train tickets to Tibet are always hard to get, flying to Tibet reduces the risk that your tour plans fail. 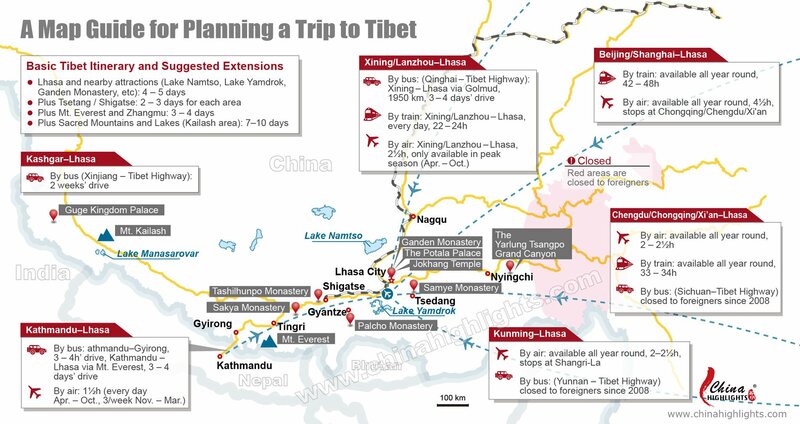 Here is a map guide for you to plan a Tibet trip. You may click the map to see a high-resolution one. Good news! 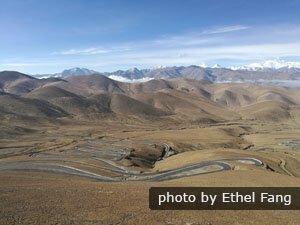 The overland border crossing between Tibet and Nepal has reopened! Usually you don’t feel uncomfortable when you just get off the plane at Lhasa. But you will feel headache after a few hours, especially at night. 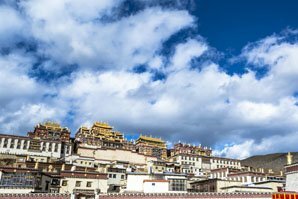 You should spend a couple of days in Lhasa to acclimate to the high altitude. If you don’t feel well before you depart for Tibet you are not suggested to go to Tibet. Even a cold can make altitude sickness feel a lot worse. Don’t over-exert yourself (e.g. even walking for a long time). Don’t take a very hot bath/shower on the first night (to avoid fainting). Get more tips and suggestions about How to Deal with Altitude Sickness. We have more Tibet tours, or we could create your own individual journey. 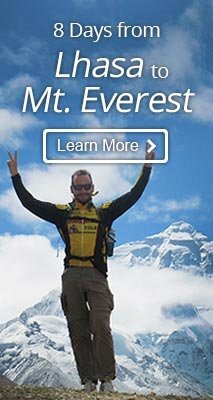 Also we are confident that we can tailor-make you a tour to include a true Tibetan flavor, even if you can&apos;t get to Tibet for some reason. The reality is that there is still some difficulty in touring Tibet. Flights/trains are limited, and altitude sickness may be an issue. Therefore it is worth considering our alternative tour options. 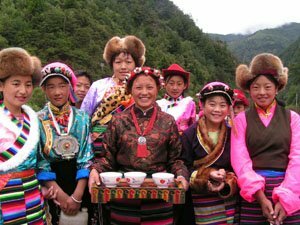 Provinces bordering Tibet (Qinghai, Sichuan, and Yunnan) have many of the attractions Tibet does, without the access restrictions. The following places will be less-crowded, less high (less risk of altitude sickness), and less expensive. Shangri-la in Yunnan may not have the Potala Palace, but it does have Tibetan Buddhist monasteries, and Tibetan villages and people. Ganzi&apos;s Dege Scripture Printing Lamasery near the Tibet border is a storehouse of Tibetan culture. Tongren in Qinghai Province may not have monasteries as famous as Ganden or Tashilunpo, but it is the birthplace of Tibetan thangkas, and has some notable Buddhist temples/monasteries. 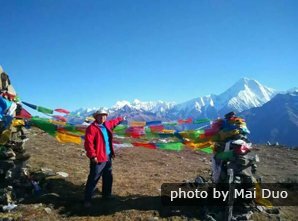 Sichuan Province may not have Mount Everest, but Ganzi Tibetan Autonomous Prefecture does have Mount Gongga, the most easterly 7,000m+ peak in the world, and a beautiful scenic area in Hailuogou Forest Park, to appreciate it from. Nine Village Valley (Jiuzhaigou) may not have Lake Namtso, but it&apos;s placid mountain lakes, and the rainbow-colored waters in its unspoiled valleys, are every bit as inspiring. Characteristically Tibetan landscapes of Yunnan&apos;s Shangri-la include sacred snowy mountains, tranquil lakes, glaciers, and high-altitude valleys.